Bytecoin (BCN) was the first CryptoNote cryptocurrency, based on an entirely different codebase than Bitcoin’s. Almost pulling the wool over the eyes of the entire cryptocurrency community, the scam was revealed some years ago and resulted in only a handful of CryptoNote cryptocurrencies retaining the trust of users. It is the cryptocurrency market’s equivalent of a black hole; no one knows who created it or how many investors have been fooled. In this article, we explore how Bytecoin almost pulled off the biggest scam in cryptocurrency, the connections between the shady project and the crypto ecosystem, and how it was unveiled as a fraud. Birthed by a team of anonymous developers, Bytecoin has been in existence since 2014. Recently, the project has resurfaced (probably due to the massive public interest in cryptocurrencies as bitcoin soared to new highs in December 2017) as shown by a press release on February 6 and an introductory article published January 2018 via two established crypto media outlets. Were they unaware of the scam and the history? Or were they just following the money? Likely, the latter. Here, we go through the Bytecoin scam and how it was uncovered. While those supporting Bytecoin will point to their massive gains and that everyone else is jealous and missed the boat, it doesn’t mean it is a legitmate project. And even so, if you can make money on it, you are dancing with the devil and perpetuating a fraud that should be called out for what it really is. The author is sure that the early BitConnect investors felt that everyone was jealous of their massive gains until it got shut down and was outed as a scam. With Bytecoin, it is much harder to shut down, but we can give observers and investors the real story and inform them of the fraud. But first, let’s look at why the altcoin is a fraud and why it should not be trusted. 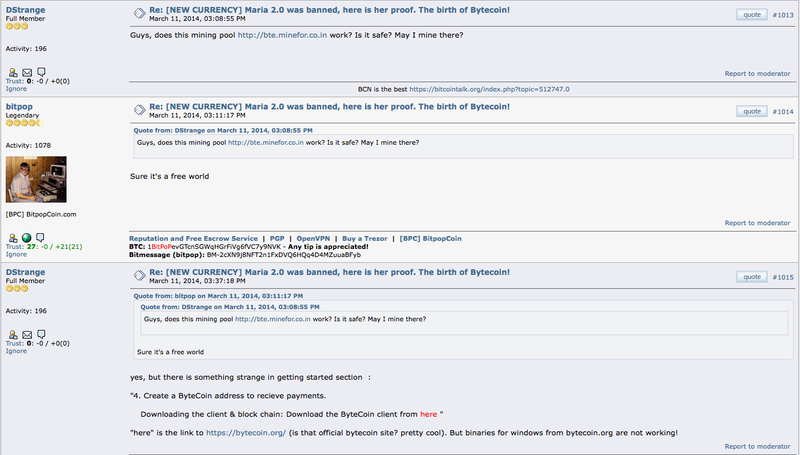 Bytecoin’s story (or what they wanted everyone to think) is that it started in April 2012. All copyright was attributed to the ‘CryptoNote developers,’ which means that the CryptoNote developers and Bytecoin developers at the time are most likely the same group. But the problem with this is that no one had heard of Bytecoin before 2014 when the cryptocurrency was actually released. None of the developers named on the CryptoNote website are known individuals, raising some concerns amongst those in the cryptocurrency community. Now, the underlying technology of CryptoNote is sound; transactions are private and unlinkable. While the technology works, the team behind it are all unknown; usually, computer scientists, mathematicians and the like have some sort of presence in the academic world or social media. Coupled with the fact that the team made the claim that the altcoin has been used on the Dark Net for two years in 2014, many suspected something to be off about Bytecoin. Another thing that is suspicious about Bytecoin is how it was stumbled upon ‘accidentally’ by a bitcointalk user by the name of DStrange. Another user also played out the same story, and it could be possible that both were in on Bytecoin, making it seem like an innocent discovery. Both accounts were created in late 2013 and started to post on the forum in January 2014. So how did Bytecoin become uncovered as a scam? Well, the evidence is in the CryptoNote whitepapers. Versions 1 and 2 were signed by an individual known as Nicolas van Saberhagen on December 15, 2012, and October 17, 2013, respectively. The name is most likely a pseudonym, but the CryptoNote protocol has been linked to the Stanford Bitcoin Group. When reading the files in Adobe Acrobat (which you can verify for yourself here and here) and examining the signatures, we come across something strange. The date of the signatures are according to the clock on the signer’s computer, which means that whoever signed it could have just manipulated the time on their machine to make it appear the whitepapers were released earlier than they actually were. No TimeStamp Authority is used by the CryptoNote developers, which raises a lot of suspicion, as it is pretty trivial to do so and would give the project some credibility. Next, another indication that the creators decieved people was that the whitepapers included a reference in the footnote that did not even exist in December 2012. 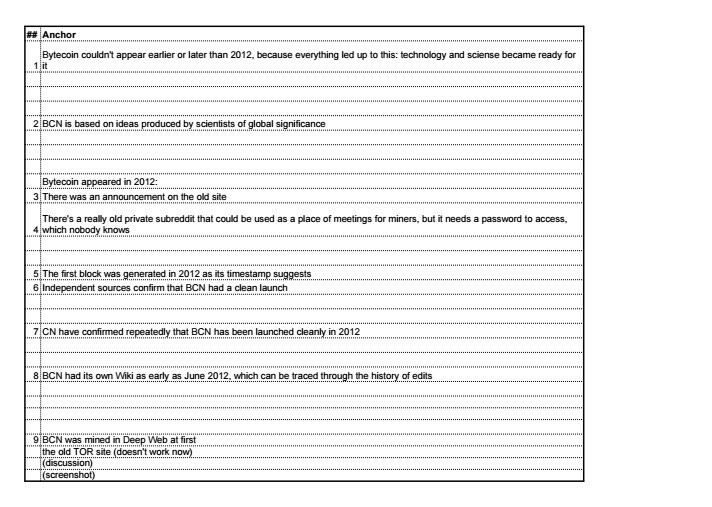 Looking at the version 1 whitepaper’s references, we come across the following bitcointalk post, highlighted below. When clicking that link, we get to a post dated May 5, 2013, which was after the whitepaper was supposed to have been signed with a PGP signature. As rethink-your-strategy points out, further investigation of the whitepapers leads us to the fact that they were made in TeX Live 2013, something that also did not exist in December 2012. The XMP properties also reveal that the actual date the first whitepaper was created was in April 2014 and while the second was created around a month earlier. Now the pieces come together; two whitepapers were created to fool everyone into thinking that the cryptocurrency had been around since 2012. The second paper was created to mislead people and give some credence to the claim that Bytecoin had been around for two years on the Dark Net. Also, the coin was pre-mined (over 80 percent of its supply), to make the story consistent, which basically means that the majority of the supply was created as the coin launched, with no one the wiser; if the scam wasn’t revealed, people would just think that the supply was emitted over the course of two years. So these are the hard facts. The CryptoNote developers intentionally mislead everyone. The papers were not signed in 2012 and 2013, but rather they were both created in Spring 2014. An audit of the coin’s supply showed that 82 percent of all Bytecoin ever to exist was already circulating at the time of launch. Thankful_for_today, one of the originators of the Bitmonero fork that moved away from Bytecoin (and eventually evolved into Monero), calculated in April 2014 that 151.2 billion coins had already been mined and mentioned that whether it is good or bad, depends on who holds the 82 percent of the total supply of BCN. Riccardo Spagni (a.k.a. Fluffypony) of Monero also stated in 2015 that the 82 percent pre-mine would make the coin centralized, as the large proportion of the supply in the hands of unknowable, untrustworthy people. Further, he pointed to ‘crippled mining code’ that was done intentionally to make the falsified blockchain with two years of fake history seem genuine as another reason to steer clear. The community later forked BitMonero away from Thankful_for_today and morphed into Monero. The mysterious founder of BitMonero is speculated to be part of the Bytecoin scam and may have been a part of many forks to introduce new CryptoNote coins to populate the cryptospace and extend the scam even further. As the mask was uncovered and Bytecoin was recognized to be a scam later in 2014, many forks started to pop up, which seemed to be an attempt to rectify and rebrand the fraud so that no one would notice. BitMonero was the first (later taken back by the community after the authoritarian style of Thankful_for_today), with Fantomcoin, Quazarcoin, HoneyPenny and Boolberry following thereafter. The thing that links Bytecoin to some of these forks is SourceForge, suggesting that there is a likelihood that the forks are from the same, anonymous people who created BCN in the first place. Now compare that to Monero, a project that has identifiable, well-known personalities working together on the code since 2014. As a consequence, it is rumored that the Bytecoin developer’s (or those connected to the project) led a smear campaign against Monero, in an attempt to destroy the reputation of any CryptoNote coin they did not control. 2) All of the CN domains use WhoisGuard or similar private registration services. With a solid technology, the Bytecoin creators were so close to fooling everyone. If Monero had not been forked away from Thankful_for_today, it would have been an extension of the scam, instead of the respected cryptocurrency it is today. With all of the evidence presented above, it is clear that Monero is one of the only CryptoNote coins that deserves your attention. Fast forward to 2017, and more bad news for Bytecoin emerged. The Monero team revealed that all CryptoNote currencies had a flaw that allowed an infinite number of coins to be created in an undetectable manner, unless the observer knows what they are looking for. Monero was not found to have been compromised, and once the bug was fixed, the team notified all of the CryptoNote projects, with only AEON, BoolBerry, and ForkNote following their advice and updating to eliminate the risk of infinite inflation. Bytecoin, on the other hand, did not remedy the flaw, along with DigitalNote and Dashcoin. The infinite inflation bug serves as a rebuttal to those who claim that people critical of Bytecoin are just mad they missed out on the gains the cryptocurrency has made; with an infinite amount of coins, someone taking advantage of this exploit could pump the price, creating fake BCN out of thin air and manipulate the order books to push the price higher artificially. Why Bytecoin is still trading on any exchanges is anyone’s guess, but only three exchanges support this coin; HitBTC, Poloniex and Stocks.Exchange. The next section provides some clues as to why the coin is still offered on a handful of exchanges. As we get deeper into the Bytecoin story, it is not just about fraud and deception; it is also a story of potential collusion and collaboration. It was a well planned scam, with a lot of thought behind it, along with many partners to give people the bait and get them to bite. Bytecoin is connected somewhat to many entities in the cryptocurrency space including; ChainRadar, Changelly, CoinTelegraph, Fairproof, Freewallet, HitBTC, and MinerGate. Minergate was the first CryptoNote mining pool and emerged in March 2014, just before Bytecoin was released to the unsuspecting public. Given the complexity of the CryptoNote protocol and lack of documentation, it is reasonable to assume that the people behind MinerGate were probably the same people behind Bytecoin. Furthermore, the closed source mining software focuses mainly on CryptoNote coins, suggesting another link. Changelly, which has been frequently been accused of scamming people for their crypto when using their exchange services, is run by the same people who introduced MinerGate. Their exchange service also offers Bytecoin and many of the CryptoNote coins highlighted earlier. Now, HitBTC is one company that is advertised consistently on MinerGate. The exchange is also one of the only places where Bytecoin is offered, as well as the other sleeper scam coins like Fantomcoin, which is suggested to be the backup plan along with other Bytecoin forks. Looking at a review website for crypto exchanges, we see that HitBTC has 318 reviews with an average score of 1.38 out of 5. The company that owns HitBTC has an address out of a virtual office in London, UK, which doesn’t instill much confidence. Another place where we see MinerGate and HitBTC advertised is CoinMarketCap, one of the most popular websites not just in the cryptocurrency space, but in the entire world. However, unlike Onchainfx, there is no disclaimer about Bytecoin’s pre-mine, giving investors and traders no warning whatsoever of the multiple red flags surrounding the altcoin. And then there’s the media, the source for many people to learn and find out about cryptocurrency. When pressured to reveal who is behind CoinTelegraph, generic responses about ‘decentralized ownership’ were given. No one knows who’s really in charge of the media outlet. What is clear though is that CoinMarketCap and CoinTelegraph have some sort of partnership and explains why Bytecoin is framed as just another cryptocurrency on CoinMarketCap. An article titled, “CryptoNote-Based Bytecoin Turns 3, Plans to Implement Colored Coins & Smart Contracts” published by CoinTelegraph in July 2015 says it all. There is a clear attempt to frame Bytecoin as some sort of significant cryptocurrency, and searching their site for the keyword ‘Bytecoin,’ there are even attempts from 2017 to namedrop the altcoin in their headlines. Now we have come full circle. Bytecoin may have initially been promoted by CoinTelegraph due to their connections with MinerGate or due to the fact they are funded by the creators themselves. In 2018, we are seeing other media outlets refresh the scam, as the altcoin tries to wash away it’s shady past with a ‘new development team,’ and ‘software updates.’ The takeaway from this article should be that out of all the CryptoNote currencies, only AEON and Monero are, with a reasonable degree of certainty, legitimate projects. After having not one known person connected to the project, an individual known as Jenny Goldberg emerged as their community manager. Who knows whether the same people who created Bytecoin are trying to fool people again, but most likely it is a new team. Bytecoin have provided a rebuttal to some of the claims mentioned above; it is up to the reader to decide for themselves, but in the author’s opinion, the response is weak. Nevertheless, the story is the same; infinite inflation and no information on who holds the 82 percent of the coin’s total supply means you should give it some deep thought as to whether it is worth it to lose money by buying the coin or whether you will have no qualms about perpetuating a scam. In short, it’s the equivalent of a black hole in the crypto world; no one knows the origin and no one knows how much the scammers have made. Many thanks to rethink-your-strategy, (a BTC/XMR donation is coming your way) for first analyzing the Bytecoin scam, and Ian DeMartino, for having the integrity to speak up and set an example for journalists in the cryptocurrency space. This article was updated Feb 18. to include Bytecoin’s rebuttal to the claims.